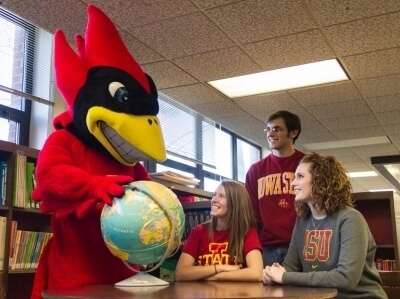 Cy the cardinal was inspired by the school colors, since a cyclone was a hard costume to make. Iowa State University's Traditions webpage includes the lyrics to the Iowa State fight song and the love story of Lancelot and Elaine, the campus’s pet swans. Distance students can experience a campus tradition by listening to a live, daily broadcast of the Bells of Iowa State at 11:50 a.m. Central Time each weekday that classes are in session. Learn more about the Bells of Iowa State and the Campanile that houses them from the ISU Foundation webpage. If you make it to campus, do as the locals do: step over the zodiac relief on the floor of the Memorial Union to avoid bad luck, or override a misstep on the zodiac relief by tossing a coin into the Fountain of the Four Seasons outside the front door.